PJX wants to buy another gold mine in B.C. Reference image. 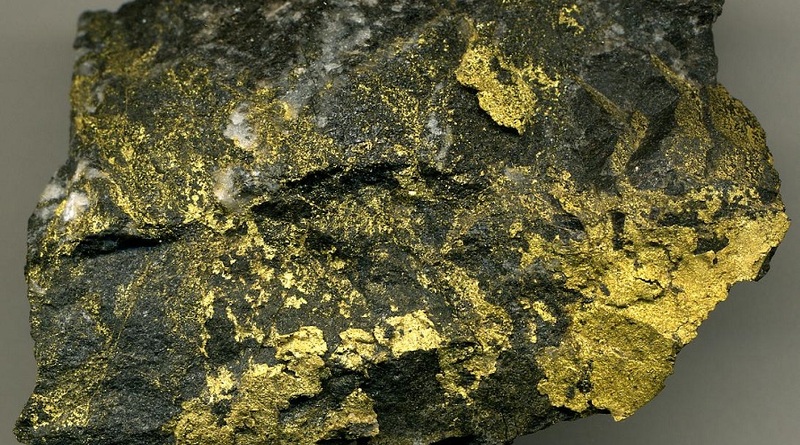 Gold ore. Photo by James St. John, Wikimedia Commons. Toronto-based PJX Resources announced it has acquired an option to earn 100% interest in the Gold Shear property, located 29 km southwest of Cranbrook, British Columbia. According to a corporate press release, the property hosts the high-grade David gold occurrence and is adjacent to PJX's Eddy property. Historical data from the provincial Ministry of Energy Mines and Petroleum revealed that gold was first discovered in 1990 when an exposure of gold-mineralized quartz veining within a shear zone was chip sampled across 40 centimetres and assayed up to 144 grams per tonne gold. Since there isn't a recent resource estimate for this property, the miner quotes historical information from a 1991 report in the ministry's archives as a reference of what might be found at Gold Shear. "Inferred resources for this zone are 96,000 tonnes grading 13.08 grams per tonne gold (uncut) or 7.11 grams per tonne gold (cut)." Taking into account the fact that the place has not been explored since 1996, John Keating, President and CEO of PJX Resources, said that his company believes that untapped resources are significant. The strike length of the shear, the shallow depth of historical drilling, the good gold grades and apparent continuity of the David occurrence are the pieces of evidence that support such belief. "Our plan is to compile all available historical data to help identify structural and other controls for gold mineralization and then drill to expand the gold zone or zones on strike and at depth,” Keating said.